Update: Don’t you hate confidently inking in the wrong answer? 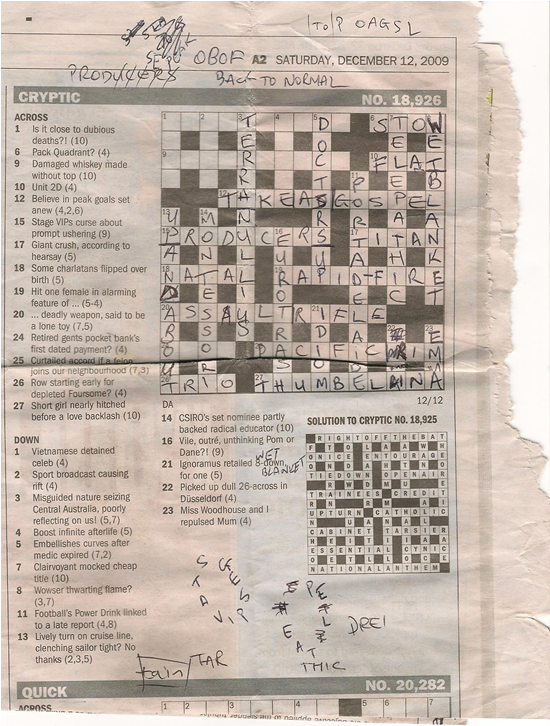 Another very difficult crossword. Not as good as last week’s, although DA has created an &lit that perhaps surpasses last week’s career-best effort. RC and I only briefly joined forces on Sunday, but it was long enough for me to give him a bum steer on 5 down (I was certain it was doctors up). But when I discovered that was mistaken, the crossword had been irrevocably sullied, and, as TT would have done, I did not want to continue on what was a dog’s breakfast. Not too bad today. 1A, 15A, 3D, 11D, 13D nice clues. 3d gold. Nice &lit, with a bit of editorial comment thrown in. nasty, nasty DA! He’s not taking his foot off the pedal at the moment. Quite a task getting this one out.2D a bit iffy I thought. Liked 3D( loaded with “stuff”) and 4D was cute. My pick: 13D, 25A and 27A.Think I got 15A but it seemed a bit clunky. Took me longer than usual, but got there (I assume). Loved 19A and 20A, also 3D. 25A, in fact the whole South-east corner took me a long while. There are still a couple for which I’m sure I have the correct answer, but I can’t fully understand why. Had to go to the confusions post for 24A. I think we’ve had a discussion about 2D before. Some good stuff: 3D, 8D, 14D, 16D, 21D, 19A, 20A. Bit of a mixed bag this week, I thought. 3D good &lit. Also liked 25A, 27A, 8D, 13D. Couple of dodgy homophones, including 2D. (Yes, haiku I’m sure we’ve had that before). 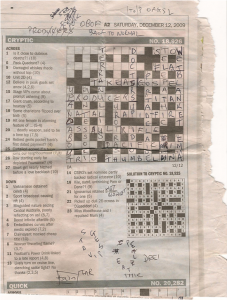 Missed out on 3 clues (with the help of friends down at Apollo Bay for the weekend). What are the answers to 24A, 22D, 23D?